Humanoid Robot Market size was valued at over USD 450 million, with global shipments of over 90,000 units in 2016. Rising demand for providing assistance to customers in retail stores will drive the humanoid robot market over the forecast timeline. Deployment of such robots in the stores as a guide and shopping interpreter helps in improving the overall customer experience and helps their human counterparts focus on more important tasks. Due to the ineffectiveness of traditional promotion activities and methods used by brick and mortar stores, these devices have the potential to effectively deliver promotions and offer a more customized experience to customers. Furthermore, the capability of the robots to identify customers and provide recommendations based on the purchase history contributes to the industry demand. For instance, Nestle Japan planned to deploy humanoid robot, Pepper to sell the company’s coffee machines in order to enhance the brand engagement with consumers. Increasing demand across the education and research sectors is expected to catapult the adoption of humanoid robot market over the forecast timeframe. Rising use of such products as a standard educational tool and research platform is contributing to the growth. Schools and institutes across various regions are increasingly utilizing the robots for STEM education as number of students are experiencing a degradation in their skills associated with these subjects. The growing enthusiasm among students for humanoid robots offering human-like interaction in the classroom is anticipated to drive the humanoid robot market. Factors such as high cost of humanoid robots depending on the advanced technological features coupled with the consumers’ reluctance to adopt is anticipated to hinder the humanoid robot market growth over the future. However, the cost of the robots is expected to come down as more number of companies are entering the market with innovative and cost-effective products. 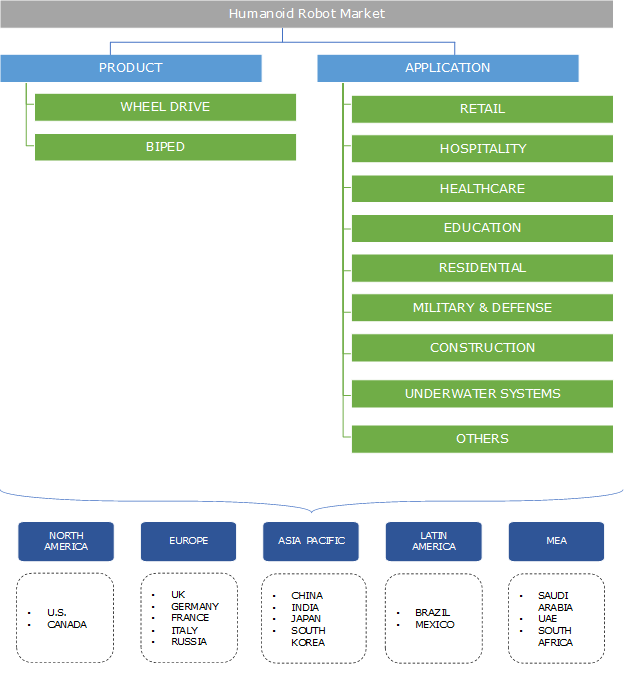 The wheel drive robot market is expected to grow at a CAGR of over 35% from 2017 to 2024. The growth can be credited to the increasing deployment across various industry verticals such as retail, healthcare, education and hospitality to enrich the overall customer experience. Considering the importance of customer service, the robots are used to help human staff with a whole lot of tasks required to provide each customer with personalized service. In addition, increasing use for crowd management, customer interaction as well as broadcasting promotional activities further contributes to the humanoid robot market growth. Growing adoption in military & defense industry in security & surveillance applications across various check points will drive the humanoid robot market growth. This growth can be attributed to the rising instances of trespassing and other security violations in major economies. On account of the enhanced capabilities of the robots such as auto detection of trespassers and sounding alarm to inform the security personnel for unauthorized intrusion, these robots are witnessing rise in adoption to provide effective protection of people and property. Hospitality applications provide significant opportunities to the humanoid robot market. Increasing use to effectively reduce costs and streamline various business processes is expected to drive the humanoid robot market demand over the forecast timeline. The integration of advanced capabilities will improve the operational efficiency and reduce the error margin to a great extent. Furthermore, the capabilities of these devices to handle a large number of tasks which include room service and managing the front desk is leading to their increasing adoption. Asia Pacific is anticipated to witness huge adoption and will dominate the humanoid robot market with a significant share of revenue. It can be attributed to the increasing R&D investments coupled with the presence of large number of players operating in the industry. Increasing adoption of the robots across department stores, banks, hotels and airports will drive the regional market growth. In addition, the rising use of such robots by healthcare facilities in Japan to provide elderly people with a better quality of life will have a positive impact on the industry. MEA humanoid robot market is estimated to grow at around 30% CAGR in terms of revenue over the forecast timeline. It can be credited to the growing deployment of the robots for patrolling busy areas, as a part of government initiative aimed at replacing human security staffs with robots. Moreover, the regional government’s plan to reduce the number of police force by incorporating robots for chasing down suspects and collecting evidence further contributes to the humanoid robot market demand. Some of the players in the humanoid robot market include Qihan Technology, Softbank Robotics, Robotis, Ubtech Robotics Inc., DST Robot, Bluefrog Robotics, Engineered Arts, Trossen Robotics, Kawada, Hanson Robotics, Honda, Toshiba and Hajime Research Institute. With the increasing entry of new players bringing in products with advanced technological features, the industry is currently witnessing intense competition. The companies are investing heavily on R&D and increasingly focusing on innovations to gain a competitive advantage. 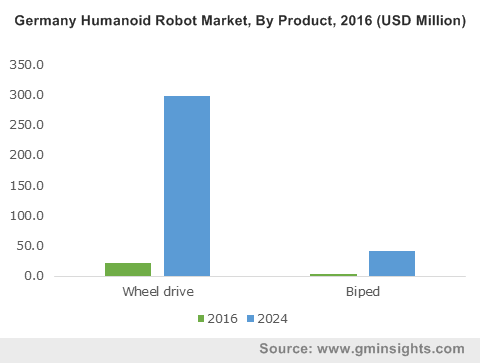 The humanoid robot market players are increasingly focusing on R&D to bring in innovations, incorporate next generation robotics and advanced technologies such as artificial intelligence and big data analysis. In order to meet the ever-increasing demand and provide indispensable service to retail, healthcare, hospitality, education as well as government, companies are launching robots with intelligent and cloud-enabled features. Businesses across the globe are increasingly adopting the technology to boost the productivity, enhancing customer experience and upgrade the way of customer interaction. The high cost is a major barrier to mass adoption as the technology is under development.